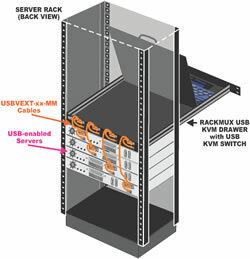 The NTI KVM Drawer with USB KVM Switch (RACKMUX-UW15-8USB) maximize the utilization of data center space. The NTI KVM Drawer with USB KVM Switch (RACKMUX-UW15-8USB) combines a rackmount LCD monitor, USB keyboard, USB touchpad mouse and NTI's UNIMUX 8-port USB KVM Switch into a space-saving 1RU industrial strength drawer. Control up to eight USB-enabled PC, SUN, and MAC computers. Display automatically powers off when in closed position. Designed to fit into a standard 19" rack/cabinet. Front panel conceals the unit when it is not in use. Drawer is adjustable to various rack depths. 17" drawer ranges from 22.2" to 33.5"
Switch: 110 or 220 VAC at 50 or 60 Hz via IEC connector.